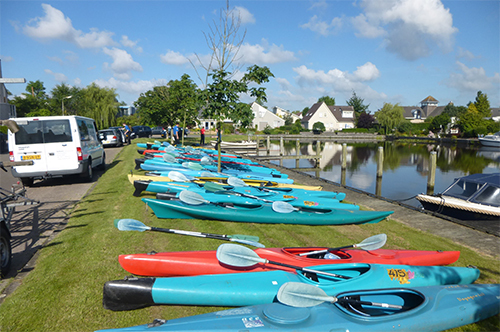 Canoegroups of 10 persons or more can get interesting discounts on the below listed day- and weekrates. Don’t hesitate to ask for our grouprates! Highseasonrates are used in the weekends of Ascension and Pentecost, all weekends of June and from July 6th until September 1st. If you don’t see low-seasonprices listed, then the prices of the high-season count here. Dayrental is in May, June, July and August from 09.00 until 19.00 o’clock on mondays through saturdays. On sundays from 10.00 until 19.00 o’clock. In all other months we're open until 18.00 o’clock. Reservation is possible, but only by rent for at least one full day. The mentioned prices are excluding fuel, except the prices per hour. € 300,00 (cash, as it isn't possible to pay with any cards). Do you take a dog on board of one of our sloops, then we will require an additional € 10,00 per rentalperiod for cleaning afterwards.